Many of our favorite necklace chains actually have names for their specific designs. Here are 3 more popular neck chains and the description of their design to help you determine which one is right for your jewelry pieces. 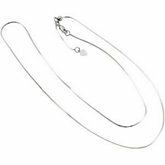 Cable Chains - A cable chain is one of the most common and most basic neck chains that a man or woman can add to their jewelry wardrobe. They can be worn alone or with your favorite pendant or enhancer attached. They remind me of those paper chains we used to make during the holidays to decorate our home and holiday tree with. Each oval or circle is connected together in the opposite direction. They can be made from fashion jewelry metal, gold, sterling silver, stainless steel or even platinum. 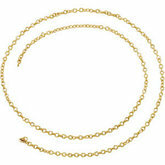 Snake Chain - One of my favorite neck chains happens to be the snake chain because it is durable and so versatile. A snake chain is made up when the jeweler connects round metal rings, side by side. A snake chain feels very smooth against the skin and is very flexible. You mostly see snake chains in the female jewelry marketplace. You can wear the chain alone or with your favorite pendant or enhancer attached to it. Snake chains come in various metals so the prices can vary from super affordable to moderately expensive. Ball Chain - I think most women and men have at least one ball chain in their jewelry box or at least have had one in the past. Many necklaces that you can purchase often come with a delicate sized ball chain. Just like the name implies, a ball chain is a series of round balls that have been connected to a chain. They can be made from various metals ranging from fashion jewelry metals up to the ultra chic platinum metal, so prices can vary widely. These types of chain are rarely worn alone and more often than not, they have a pendant attached to them. Using these descriptions, you should be able to recognize and decide which neck chain is best for the jewelry piece you want to attach. Some chains are better than others for particular applications. They are all pretty in their own right and would look great in simple layers too.